If you’ve been searching for office chairs on sale for a business in Canton, Georgia, you’ll want to learn more about NorthPoint Office Furniture. Founded in 1994, our family-run business specializes in selling new and used office furniture for commercial and home offices. Customers know to turn to us for our budget-friendly prices and varied selection of premium furniture. Our chairs come in leather, cloth, wood, and plastic, so you’ll be certain to find a material best suited to your needs. While most chairs come in black and burgundy, customers can customize our Fairfield chairs by choosing the fabric, wood frame colors, styles, and more, ensuring that it fits perfectly with their existing office décor. 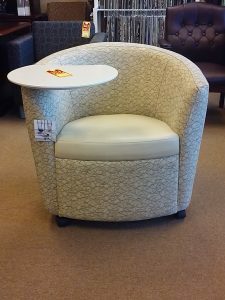 We also have varied styles of chairs and other office furniture, including traditional, transitional, and contemporary. To learn more about the office chairs on sale at NorthPoint Office Furniture, contact us today. We are proud to serve business owners in Canton, GA, and surrounding areas.